Fresh bread is one of the most satisfying things to bake in a wood fired oven. However, if you are planning to make several courses, removing the coals is not ideal. An easy and fun solution for creating a perfectly crusted bread is to cook your dough in a Dutch oven – thus, allowing you to continue to enjoy baking throughout the day and keep the rest of your meal cooking too. 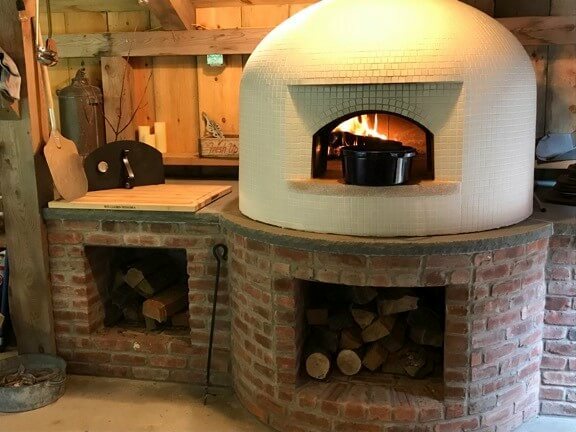 Dutch ovens have been used in wood fired cooking for centuries. A Dutch oven is a thick-walled cooking pot with a tight-fitting lid. The most common variety is made of seasoned cast iron; however, it can also be made of cast aluminum or ceramic. Some metal varieties (steel) are enameled, rather than being seasoned. You can use your favorite bread recipe as the base; we then modify it slightly to account for the oven. Or try the recipe below. Combine the flour and the water until just mixed; rest for 30 minutes. Integrate the salt and the yeast, mixing until fully integrated. Fold the dough two times over the next 1.5 hours. Rest for 3.5 hours. Turn the dough onto a floured surface, adjusting the flour, as needed based on moisture level. Line your Dutch oven with parchment and place your dough in the center. Rest for 1 more hour. 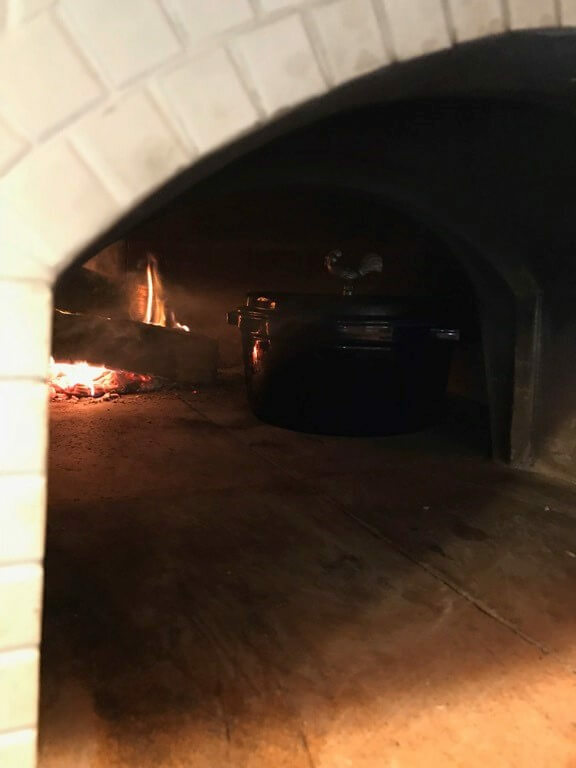 Heat oven to 450°F and place covered pot into your oven adjacent to the flame. Turn once approximately 15 minutes into cook time. Return to oven for another 15 minutes. Gently remove from oven. Note: The pot will be extremely hot! Lift the lid to gauge the color and crust. Bread should be deep golden on the outside with a nice, hard shell. Rest the bread in the Dutch oven with the lid off for approximately 10 minutes before removing to a cooling rack for 1.5 hours before slicing. 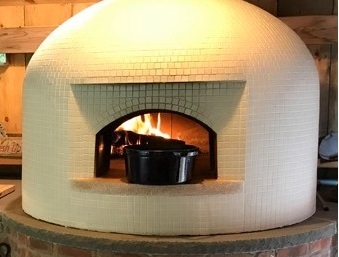 The Dutch oven protects the dough from burning when there is a live fire in the oven.